If you were to prepare a meal using only the individual foodstuffs that I have featured as ‘great things’ in this blog, you’d have the following menu of ingredients to work with: Butterscotch ice cream topping, chocolate spritz cookies, green bean casserole, Twiglets, Reese’s peanut butter cups, and Sangria. It’s kinda sorta like Charlie Brown’s Thanksgiving menu isn’t it? All we need is some toast and popcorn. The only thing with any real nutrition offered is the casserole and that’s just swimming in enough creamy mushroom sauce to drown out the green taste and any illusion of vitamin intake. Add today’ great thing to the list and you’ve got a winning seven course meal–for someone with the tastebuds of a six year old. Yes, just plain old a bag of Cheetos. 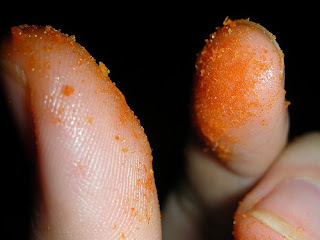 Cheedle (chee’ dul) – n. The residue left on one’s fingertips after consuming a bag of Cheetos. Unfortunately, the more you learn about Cheetos, the less appealing they become. To make them, cornmeal is boiled down to a creamy consistency, it’s then pushed through a die, hot air and steam help them expand into those little caveman club-like shapes, and then they’re deep fried. Finally, they’re covered in their flavoring which, unfortunately for my the snacking I do on my veggie days, include pork enzymes. 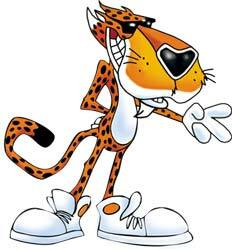 Cheetos were conjured into existence in 1947 by American hero Charles Elmer (who also developed Fritos snack chip). I enjoy books and fine foods. 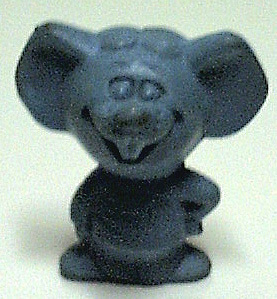 Chester has proved to be such a popular mascot that not one but TWO video games were marketed with him as the hero. I can’t speak to the sales of the games, but the fact that anyone might have bought one is mind-boggling. Still, what is it about Cheetos? I’m eating them right now. They’re so cheesy and crunchy and…fried. Yeah, I think that just about hits it on the head. They are everything I want in a non-nutritious snack. Fried-ness and cheesitude. And they’re loud in my head whilst I’m eating them. They drown out my thinking. Aw…bliss…to be alone in my head with only the sensation of fried cheese.